The Guardian and Sunday Times have both written about us again recently. The Sunday Times piece was based on an image we created showing UK participants’ average happiness throughout a full year (we got the idea from a figure showing when people take photos). In the image, lighter shades are happier. From left to right the time of day runs from 8am to 10pm; from top to bottom the day of the year runs from 1 September 2010 to 31 August 2011. 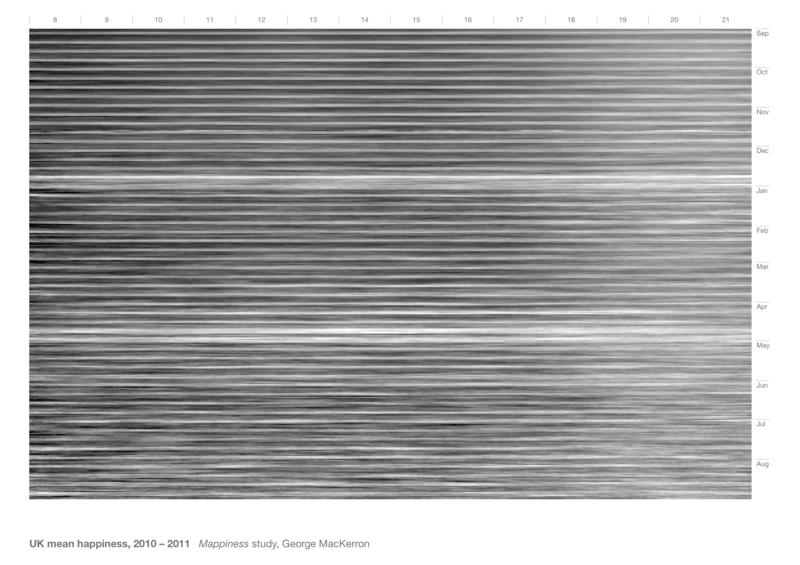 Mean happiness is calculated at one-minute intervals, based on mappiness responses during the preceding and following half-hour. There is more random variation (noise) in the later part of the year, because the sample then is smaller. Can you spot… weekends? The trend on weekdays? Christmas day? The evening of New Year’s Eve? And the April/May bank holidays, including the royal wedding? As we’ve mentioned before, the Government has committed itself to measuring national wellbeing, and to evaluating potential wellbeing impacts of policy. Gus O’Donnell, the head of the Civil Service, spoke recently on this topic at a very well-attended meeting of the All-Party Parliamentary Group on Well-being: you can hear his talk, Wellbeing Statistics: How Will Whitehall Respond. And we’ve had a brief meeting with members of the Cabinet Office‘s Behavioural Insight team, who were very interested in mappiness and in similar approaches to understanding momentary happiness. You might have noticed an update (1.1.3) in the App Store in recent weeks. We hoped this would work around a bug introduced in iOS5, which can sometimes cause the app to crash if you’ve turned on ‘Save photos to album’ in app settings. We haven’t been able to reproduce the bug for ourselves, so we’re not sure if this work-around has worked… and if it has, it may be at the cost of photos not actually being saved. We apologise for this. Apple has confirmed to us that this is a bug they’re working on, so we’ve got our fingers crossed for a fix in iOS 5.0.2. Any thoughts on international mappiness research?